Innovation Zone is your trade show innovative product launch pad. Define your show as the nexus of new and innovative products in your market place. Innovation Zone will be promoted as the show’s zenith showcase for any new company, products or services entering the industry. Attendees will now have a place to go to find the hottest products. 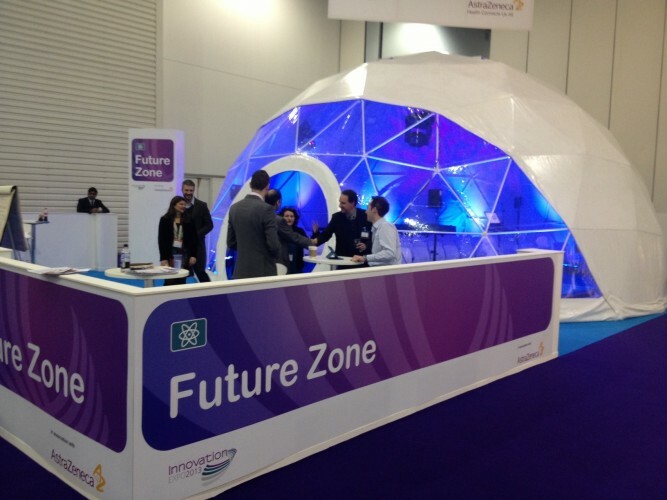 Year-to-year brands will pay for the opportunity to access and sponsor the Innovation Zone. Product Displays - Innovation Zone is series of company “Product Display Ads”, that include large information graphics, exhibitor meeting counters, for sponsor business to inform large volume attendees about their featured products. The entire Innovation Zone will function as a single show floor feature. Tied together with a single design, layout, company and fact card trivia and audience “best product” voting. Social Amplification - Every attendee will receive an Innovation Mobile Website. Mobile Website will promote the installation, advertise participating exhibitors and provide the attendee voting platform. Product Education - As you enter the Innovation Zone, you will be asked to complete a mobile fun fact survey by listing all Zone products and their essential information. As guests walk through the Zone, product facts will reveal themselves. All product related questions will be answered on the fun fact survey card. Each completed product Fun Facts Card is turned in for the chance to win a grand prize in a drawing. Peoples Choice Awards - Attendees will have the opportunity vote for their favorite Innovation Zone product or service using their mobile phone. At shows end an award will be presented to that exhibitor. This will provide a great photo and public relations opportunity. In real-time audience votes will be projected onto video monitors for excitement and conversation.